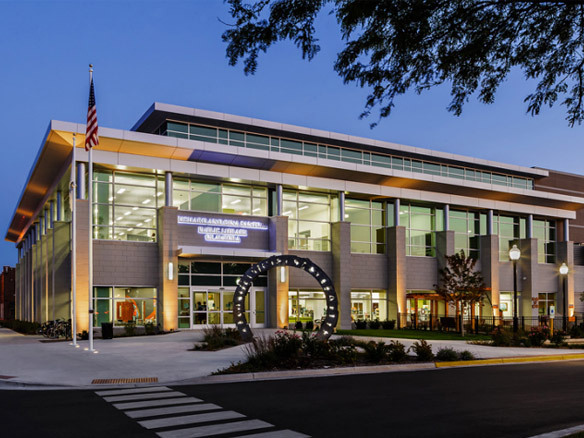 The City of Aurora opened its new LEED-certified 98,000-square-foot Main Library as part of its commitment to improving the City and its infrastructure. The new Aurora Main Library is an important new civic destination for culture and entertainment, and gathering point for the entire community. It features state-of-the-art materials handling technology; expanded space for children and youth services; meeting rooms and quiet study rooms; a dedicated maker space for experimentation with new technology; and areas for the public to gather. It provides space for the arts, humanities and historical exhibits. Its flexible design adapts easily to changing needs and technologies. It serves as the hub of a digital library network whose integrated technology systems enhance capabilities of current branch libraries, school libraries throughout the city, and two future proposed satellite facilities. The downtown Library, which serves more than 500,000 patrons each year, had exhausted its current building. The new library parallels other improvements to downtown Aurora’s infrastructure, such as the new River’s Edge Park and Waubonsee Community College’s downtown Campus expansion. The Aurora Public Library Board of Directors and Administration have been planning for a new downtown library for more than 10 years. Its Carnegie library building was constructed in 1904, underwent major remodeling project in 1942, and received a new addition in 1969. It had extensive structural and technological issues. After more than 100 years, Aurora was in need of a new flexible library design to accommodate ongoing technological advances as well as Aurora’s growing population as the State’s second largest city. The new library remains steps away from downtown Aurora at the intersection of River and Benton streets on the former Beacon-News property. Branch locations of the Aurora Public Library will also receive significant upgrades as a result of the bond sale, with two additional service points added to underserved areas of the city. The LIFE Development Center The Library’s LIFE (“Learning in an Informal and Fun Environment”) Teen Center provides technology tools for educational institutions to teach students about careers in science, math, and technology. It provides tablets, educational software, music and broadcasting equipment and other emerging technologies to help students excel. Key features include advanced technology; public internet / computer training; quiet reading areas; study/program rooms for small and large groups; space for teens, youth, and preschool patrons; and a drive-up window. As architects and engineers for the new library, Cordogan Clark & Associates facilitated the planning process, coordinating public meetings and providing preliminary design illustrations and estimated costs of construction with substantial input from a Citizens Advisory Group, Technology Committee, City Council members, School District Administrators, the public, library staff, and others. R. C. Wegman was the Construction Manager for the library. “This is going to make a major impact on changing the fabric and character of the downtown,” said John Savage, Board President of the Aurora Public Library. He added that national statistics show dramatic increases in patrons in the first three years a library is built. “We have seen a genesis of a cultural focus in the downtown.… We are excited to be part of that,” Savage said.